Presents the latest technologies in food science--including descriptions of nearly 300 ingredients used as fat replacers. 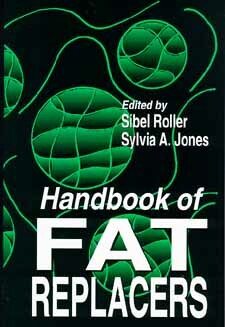 The Handbook of Fat Replacers describes in detail, for the first time in a single volume, the science and application of fat replacers in food products, including the multiplicity of technological, legislative, sensory, nutritional, and marketing issues involved. Part I of the Handbook is an overview of fundamental issues, including historical analyses and critical assessments of technological strategies, in the development of low-fat foods and the ingredients used as fat replacers. Part II discusses individual fat replacers and their properties in detail. The compounds are organized by their composition--starch-derived, fiber-based, protein-based, gums, emulsifiers, bulking agents, combination systems comprised of interactive blends, low-calorie fats, and synthetic fat substitutes, are all examined in detail. The Handbook also provides an Appendix containing a comprehensive list of fat replacers classified according to their basic composition with details on chemical composition, manufacturers, applications, and much more. This feature allows you to look up a fat replacer by trade name, determine its principal composition, and then turn to the chapter in the Handbook for additional information on the compound or on one belonging to the same class. Fundamental Issues. Issues in Fat Replacement. Implications of Fat Reduction in the Diet. Market Considerations in Fat Replacement. Physical, Chemical, and Sensory Aspects of Fat Replacement. Legislative Implications of Fat Replacement. Fat Replacers and Their Properties. Starch-Derived Fat Mimetics: Maltodextrins. Starch-Derived Fat Mimetics from Potato. Fiber-Based Fat Mimetics: Microcrystalline Cellulose. Fiber-Based Fat Mimetics: Methylcellulose Gums. Fiber-Based Fat Mimetics: Pectin. Microparticulated Proteins as Fat Mimetics. The Use of Hydrocolloid Gums as Fat Mimetics. The Role of Emulsifiers in Low-Fat Food Products. The Role of the Bulking Agent Polydextrose in Fat Replacement. The Use of Blends as Fat Mimetics: Gelatin/Hydrocolloid Combinations. Low-Calorie Fats and Synthetic Fat Substitutes. Appendix. Classified List of Fat Replacers and Their Applications. Index.